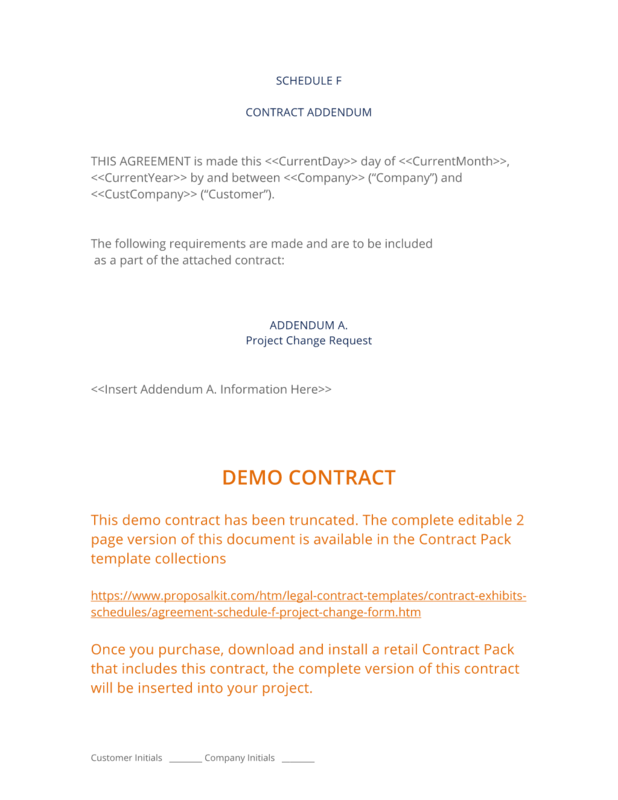 You can create your own customized editable version of this contract document using IT/Software/Hardware Contract Pack. Follow these steps to get started. The Project Change Form is used as a general modification to a contract. Use this attachment when the contract or project changes once the project is underway. This can help keep project schedules and costs under control and reduce the changes of cost overruns and missed deadlines due to "feature creep" (i.e. uncontrolled changes to the project by the client or developer beyond the scope of the original contract). to have a go to resource for contracts, have used their product for years! I am looking forward to the new revisions in this edition." 1. Get IT/Software/Hardware Contract Pack that includes this business contract document. This Schedule F (Project Change Form) (Can/UK/Aus) is included in editable Word format that can be customized in Word or by using the included Wizard software. 2. Download and install after ordering. Once you have ordered and downloaded your IT/Software/Hardware Contract Pack you will have all the content you need to get started with your own formal declaration. 3. Customize the contract template with your own information. You can customize the contract document as much as you need. You can also use the included Wizard software to automate merging in name/address data. THIS AGREEMENT is made this Current Day day of Current Month, Current Year by and between Company Name ("Company") and Company Name ("Customer"). Project Change Request Information Here. Financial Impact and Schedule Impact Information Here. The complete Schedule F (Project Change Form) (Can/UK/Aus) - with the actual formatting and layout - is available in this Contract Pack. Alternate documents are those which may be used instead of this document depending on your situation. Alternate documents may be better suited for different size projects, more specialized projects, variations on rights, etc. Related documents may be used in conjunction with this document depending on your situation. Many related documents are intended for use as part of a contract management system. Disclaimers: Proposal Kit, Inc. makes no warranty and accepts no responsibility for suitability of any materials to licensees business. Proposal Kit, Inc. assumes no responsibility or liability for errors or inaccuracies. Licensee accepts all responsibility for results obtained. Information included is not legal advice. Use of any supplied materials constitutes acceptance and understanding of these disclaimers and terms and conditions.